Jade Calhoun was never fond of her empath abilities. Now she's discovered she has another gift she'd rather not unwrap--magic. 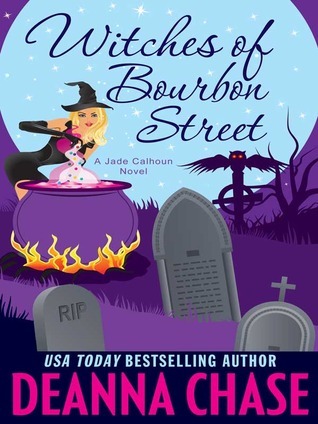 When her mentor, Bea, becomes gravely ill and insists Jade's the only one who can help, she's forced to embrace her witchy side. It's too bad she spent a decade shunning the magical community and never learned to harness her powers. Because time's run out. A trapped spirit has revealed a clue to Jade's long-lost mother. The resident angel has gone rogue and disappeared with Jade's boyfriend, Kane. If that wasn't enough, her ex appears to be possessed. To save any of them, Jade will need to find a way to control her inner white witch--without succumbing to black magic. Otherwise, she'll lose everything...including her soul. Jade Calhoun is finally going to embrace her witchy side to save her friend and mentor Bea. Problem is that she's turned her back on all things magical since her mom disappeared during a blood spell invoked by her mothers coven. Now in order to save not only her mentor but her boyfriend and mom too she has to embrace her inner spark and let the magic fly. In this second installment of the series Jade has to "Witch up" and learn how to use her magic. While most witches have time to learn how to harness their spark Jade gets a crash course in magic 101. Time has run out and she needs to save her new found family and not lose her soul in the process. This series has me hooked. The characters are clearly developed and likable. Even though Jade is a powerful witch she still shows emotions like jealousy, love and sadness and compassion. This series was the perfect read to kick off the Halloween season.